If you’re in need of gutter covers to reduce the amount of maintenance that you routinely perform on your home in Edgewood, New Mexico, or another surrounding area, turn to ABC Seamless of Albuquerque. We have assisted homeowners in the area since 1989 by offering durable gutter guards that effectively eliminate the need to clear out your gutters or downspouts ever again. 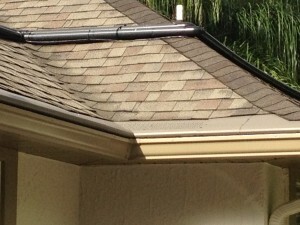 Additionally, our gutter covers will prevent animals from building nests in your gutter system, which can eventually lead to even more blockages that will prevent water from flowing freely off your roof, and away from your home’s foundation. Any water that does not properly drain out of your gutters can seep into the roofing underlayment and lead to rotting of the wood, causing extensive damage. However, with an effective gutter guard system making blockages a thing of the past, this is an issue that you will not have to worry about. To learn more about gutter covers offered by ABC Seamless of Albuquerque for your home in Edgewood, NM, or another surrounding area, contact us today.